Left-handed model with solid tonewood pairing special bracing and impressive plugged-in performance at an accessible price point. Taylor's 300 Series has introduced countless players to the pleasures of the all-solid-wood acoustic experience; it's the entry point to Taylor's USA-made instrument line. Players who step up to a 300 Series instrument, like this 312ce 12-Fret V-Class Grad Concert Left-Handed acoustic-electric guitar, will be rewarded with a guitar-for-a-lifetime that will only sound better with age. It doesn't take but a few strums to learn how the mix of tonewoods, construction and appointments combine to make Taylor's famous playability, intonation and tone. The 300 Series has everything you need and nothing you don't need in a fantastic sounding and playing instrument. The 312ce 12-Fret V-Class Grand Concert Left-Handed acoustic-electric ship in a deluxe hardshell case made by Taylor for optimal fit and protection. Taylor's 12-fret designs are appealing to many players who enjoy the guitars' compact playing framework, blending the lap-friendly GC body with the slightly condensed fret spacing of the 24-7/8" scale length and the shorter 12-fret neck orientation. This combination creates a slinky "handfeel" and easier fretting. Factor in the surprising tonal power and midrange warmth and vibrancy for a smaller body, thanks to the bridge's position near the center of the lower bout. The design is physically efficient, so it has strong projection; despite its smaller size it sounds like a huge instrument. 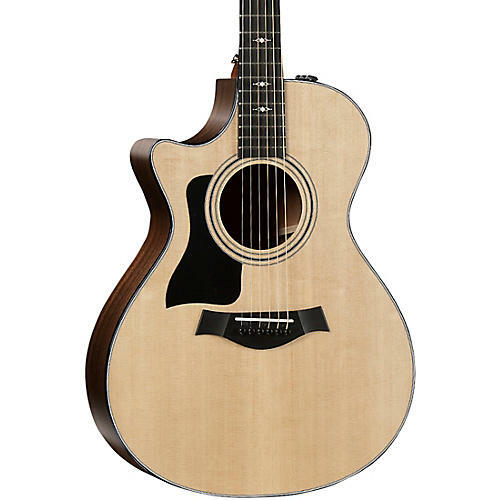 Taylor 12-fret guitars are not just great for fingerstyle and light playing; players who love strumming or digging in with a heavier attack also appreciate them for their tonal character. Pairing a 12-fret neck design with a cutaway body blends the unique response from the bridge sitting back a little farther on the lower bout with the accessibility to the upper register - you get to play the high notes. As to the slotted headstock, the angle of the strings as they bend over the nut is a little more acute, which puts a little more downward pressure on the nut. To your fretting hand, it'll feel a little more precise and better behaved as you fret near the nut; notes don't want to bend as easily closer to the nut. Like what you see? Order today.